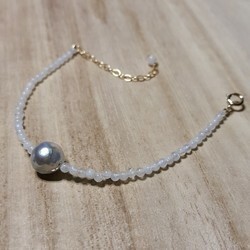 sea ​​pearls, about 8mm, bead with luster, no big flaws (no scratches), there is no smooth surface and color changes, coupled with blue moon stone and Japan 14k gold bracelet , The length of the basic set to 14-17cm, can contact the designer to make changes. Due to natural pearl shape and color will be different, the picture failed to fully 100% show, the details can contact the design museum. 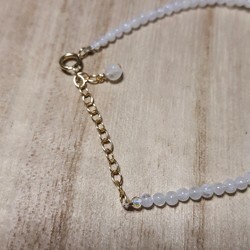 , thus forming a unique shape, color and luster, works of pearls is not perfect, but show the nature of the various beauty, and as Artisans and designers, but also with the greatest efforts to flaw into one of the characteristics of the work. Because it is a shop, there is no mass production capacity, so most of the works only one, unique. 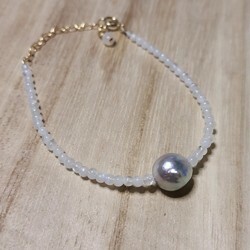 pearl surface can be. When used, avoid contact with sweat, perfume or irritating liquids. Storage can be used when the small medicinal plastic bags, preserved in a cool place. There are other works in the museum, welcome to visit.